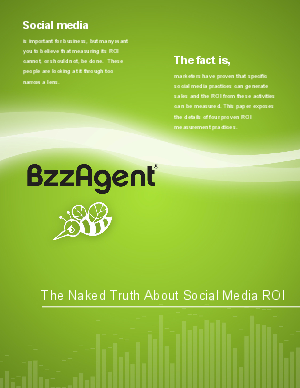 If you don't think social media ROI can be measured, you need to learn the truth. Social media and word of mouth are more influential than any type of advertising, but many companies are not measuring its impact on sales. Marketers approaching social media with a direct marketing mindset and organizing their programs with the right methodology can clearly determine its impact on sales and ROI. This ebook will show you how it is done. You'll learn 4 proven methods for measuring the sales impact and ROI of social media and how to apply a direct marketing mindset in social media to drive sales.